Been playing around with Azure Automation this past month and had a requirement to Up-scale & Down-scale Azure SQL Database tiers in an automated manner. I’m talking Azure SQL DB (DBaaS) and not SQL Server on Azure (IaaS). To get this automation, we were using the Azure Runbook Automation PowerShell workflow. There is a lot of information on the WWW showing different ways one can write a PS automation workflow. This post is to show you just 1 way that I was able to get it to work. Login to your Azure Subscription and go to the Resource Group that contains the SQL Database you need to work with. 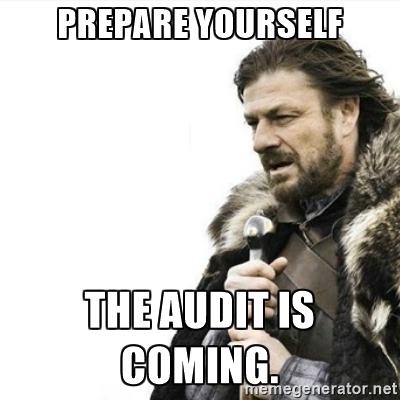 Once the automation account has been setup, open up it’s blade in the Azure Portal and got to Runbooks. You will notice that there are already 3-4 tutorial runbooks present there by default. For the runbook type, I chose PowerShell workflow. (You can use the Graphical workflow too). You should now see a new PS workflow window with the workflow name that you specified. Just like a regular PS workflow, you can define input parameters in the param () block. # Get the connection "AzureRunAsConnection"
What the above code is doing is basically using the built-in automation account called “AzureRunAsConnection” and it’s credentials to run the PS workflow. Just a quick post to help anyone out there with their first Azure Automation runbook. This post is Part 4 of my series of posts on Index Maintenance for a DBA. So here goes. Enough has been said & talked about regarding missing indexes in SQL Server. Before you read any further, it is very important to understand that “missing indexes” that your colleagues & friends talk about are really missing index “recommendations“. The keyword is the recommendations part. Take the information in this post as a whole and don’t go crazy creating every missing index recommended when you run the query given below. Refer to my earlier posts in the indexing series (duplicate, unused indexes) to know why it is a bad idea to go “index-crazy”. You need to carefully evaluate the benefits of having an index vs the cost of maintaining it. SQL Server provides exposes index recommendations via DMV’s (sys.dm_db_missing_index_details, sys.dm_db_missing_index_groups and sys.dm_db_missing_index_group_stats). These dynamic views contain information collected by the SQL Server Query optimizer engine as your DB workloads and queries execute on the database engine. Since this is “dynamic” information, it is only as relevant as your last SQL Service restart. So this is something that needs to get into your blood as a DBA to check for periodically and is NOT a one-off activity. If you create this index and it’s rarely used, you are increase the maintenance overhead and also slowly down WRITE operations on the table. IT DEPENDS, really it does! Average cost of the user queries that could be reduced by the new index. This is the current cost of the query. Average impact on the query if this index were created. i.e. The query cost would on average drop by this percentage value. Number of Seek operations that this index could have been used by user queries. Number of Scan operations that this index could have been used by user queries. Now that you understand what missing indexes are, factors to consider and the logic behind the recommendations, go ahead and run the below query on your databases. The output provides you the “CREATE INDEX” T-SQL statement that you can use to create the index, if you see fit after considering all factors mentioned so far. This saves you time having to write the T-SQL yourself. The CREATE INDEX statement will include the index key columns in order, suggest included columns where applicable. Here is a sample output from my test system showing all missing indexes recommended on the MSDB database. Did I mention that you must test these index recommendations on your Test system? If you know your application workload/query, you must test to gauge the impact of having this index. Well SQL folks, this concludes my indexing series of posts for DBA’s. Leave your comments down below if you find this useful and would like more material on these lines. This post is Part 1 of my series of upcomingposts on Index Maintenance for a DBA. So here goes. There are all sorts of indexing tuning & optimizations that can be done on a SQL database. One of the no-brainer things a DBA must do is “seek & destroy” (pun intended) duplicate indexes. Duplicate indexes are indexes exactly similar in structure, including key columns and their base tables. These indexes serve no useful purpose and in fact contribute to slowness for WRITE database operations as the WRITER (INSERT/UPDATE/DELETE) must do more work to update the index as well as this directly contributes to the slowness of a write operation. If AlwaysON or other HA, then it has to do this on all the replicas as well, adding additional unnecessary network overhead. You’d be surprised at the results. Given this script a run on any of your databases especially Vendor application databases. If you do see any duplicates, time to talk to your vendor or DB developer. Here is query that I use to identify duplicate indexes. This query considers 2 or more indexes to be Exact Duplicates when all the key columns & included columns (if any) match another index on the same table. Note: The original source script was from HERE. I’ve modified & added to this to include index key column information as well as included columns to present a more clear output on the duplicate indexes. Extra Extra – Read all about it. Here is a handy script that I used to quickly get high-level information about any SQL Server Instance. It provides basic information like machine name, number of CPU’s, memory, patch level, HA configuration and the user databases hosted on this instance. It’s been a really long (long) time since I last posted here. After a long hiatus, I have tons of new material, scripts, scenarios & solutions lined up to share with the world. Well, this post has been due for quite some time. 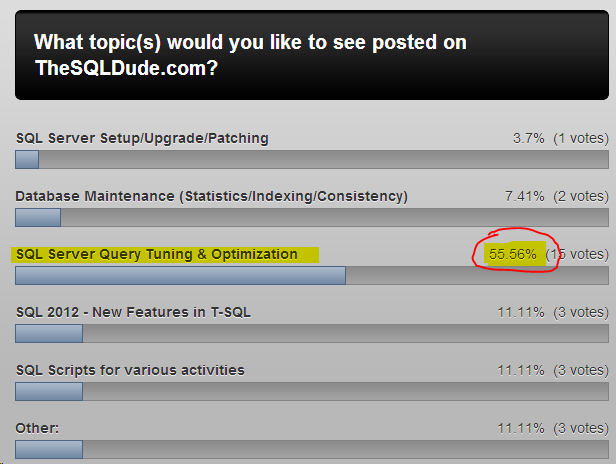 I had opened up a survey/opinion poll on https://thesqldude.com/2012/07/10/user-opinion-poll-what-topics-would-you-like-to-see-posted-on-thesqldude-weblog/ sometime back and as expected most of you out there want to see more on performance tuning and query optimization. Without much ado and by popular demand here goes a simple scenario on query tuning. I was easily able to reproduce this issue on my instance, here is how my table setup looks. I populated this table with some sample data of 1000 rows using the following script. 2) A composite non-clustered index IX_msgboard_type on the columns mb_type and mb_status (in this order). Here is what I observed when I ran the following update statement. 1. Why is the query using the clustered index? 2. Why is it performing a Scan operation? Let’s look at the update query carefully. The query is updating the columns mb_status and mb_changed_by, and there is a filter on column mb_type. You might think, well, I have an index IX_msgboard_type on the mb_type column, why is SQL Server not using this non-clustered index? Notice that the Cost for the query with index hint is higher than the one without! If the table had more rows, we would have seen a bigger difference in cost . Additionally, a Table Spool operator is now part of the execution plan. The table spool operator caches the row to be updated (In tempdb) and then feeds it to the Clustered Index update operator. This proves that SQL Server optimizer was actually choosing the cheapest and best plan it could come up with. The reason SQL Server picked the clustered index is because the query is updating the columns mb_status =10 and mb_changed_by. This column mb_status is not the leading column in the NC index IX_msgboard_type, but the 2nd column. Why does this matter? It does because, the statistics for this NC index would be built on the leading column which is mb_type. Here is how the histogram looks. To avoid a bookmark lookup (Key Lookup operator from SQL 2005 onwards), SQL Server decided to use the clustered index since it covers all the columns in the table. If SQL Server were to use the NC index, it would be do a lookup or cache the results (ahem, Table Spool operator!) and then find the matching row in the clustered index to actually update the 2 columns. This is an additional cost, and this is why SQL decided not to go with this plan. Coming to the 2nd question of why a Scan? It might surprise some of you, but a Seek does not imply good performance always. 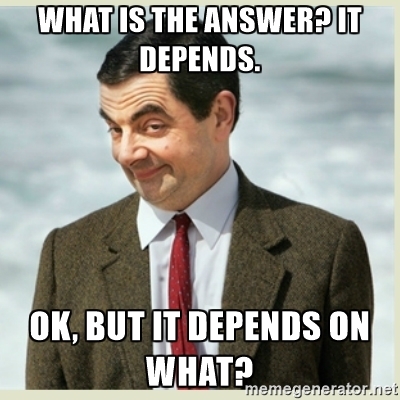 My favourite answer – “It depends”. In this case, the table only had 1001 rows and of which only 1 row (mb_id=1001) qualified for the update. 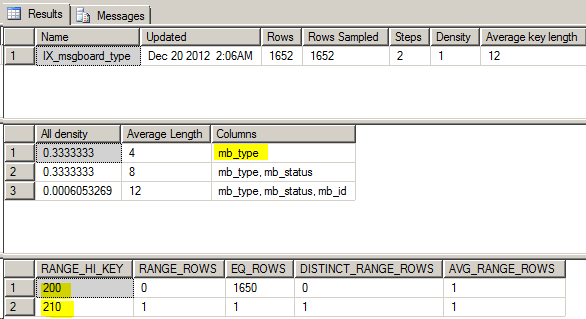 When using the CI Scan, SQL Server was applying the filter on mb_type=210 and that returned 1 row back. A Clustered Index Seek in this case would not make any positive difference in query execution time. To test this, I added the FORCESEEK table hint to this update query and as expected the query did not run faster. Instead of trying to second guess the query optimizer and trying to tweak the execution plan it is producing, this issue needs a different approach –> back to basics. Based on the query design, if the column being updated mb_status was “covered” then it would help. In this case that was also also take care of, since IX_msgboard_type also includes the column mb_status, though as a non-key column. This is an important thing and this was why the “included columns” feature was introduced. The biggest advantage of having an included column in a non-clustered index is that, the query optimizer can locate all the column values within the index. The base table or clustered index data is not accessed resulting in fewer disk I/O operations and hence faster query execution. Also, the index size is lesser since non-key columns are only added to the leaf level. Many advantages indeed. Here is how the update query plan looked after added mb_status as an included column. a) Getting SQL Server to use the Non-clustered index IX_msgboard_type, instead of the clustered index. b) Getting an Seek operation instead of a Scan. c) Query cost is cheaper. So, hope everyone understood how beneficial included columns are on non-clustered indexes. For more information on guidelines and restriction with included columns refer this MSDN article. That’s all for now folks. Keep tuned to this site for more.